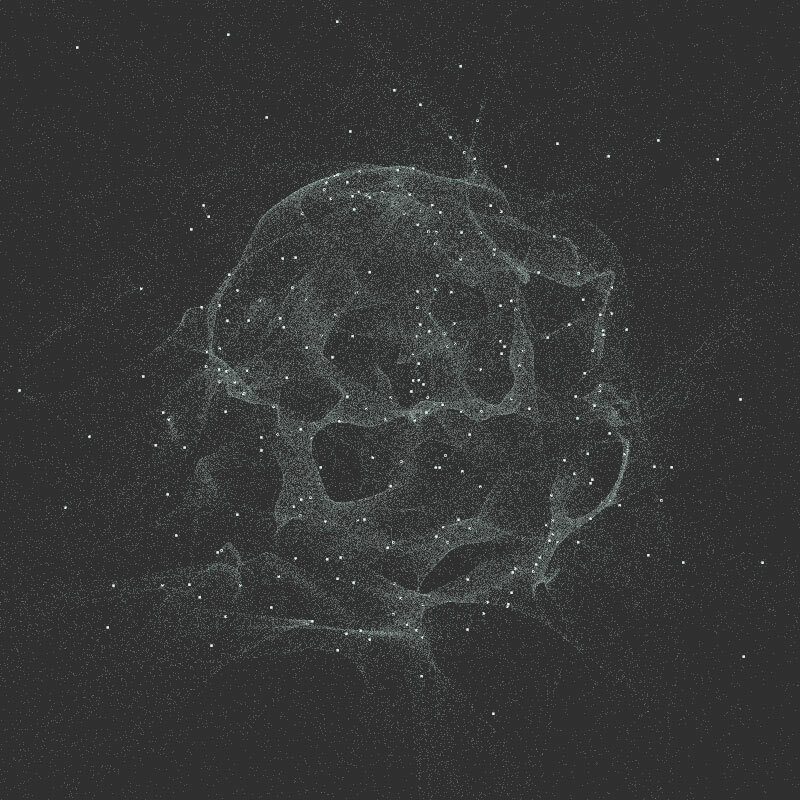 FBO particles – Youpi ! I can’t tell how many particle engines I’ve written for the past 15 years but I’d say a lot. one reason is that it’s easy to implement and quickly gives good looking / complex results. 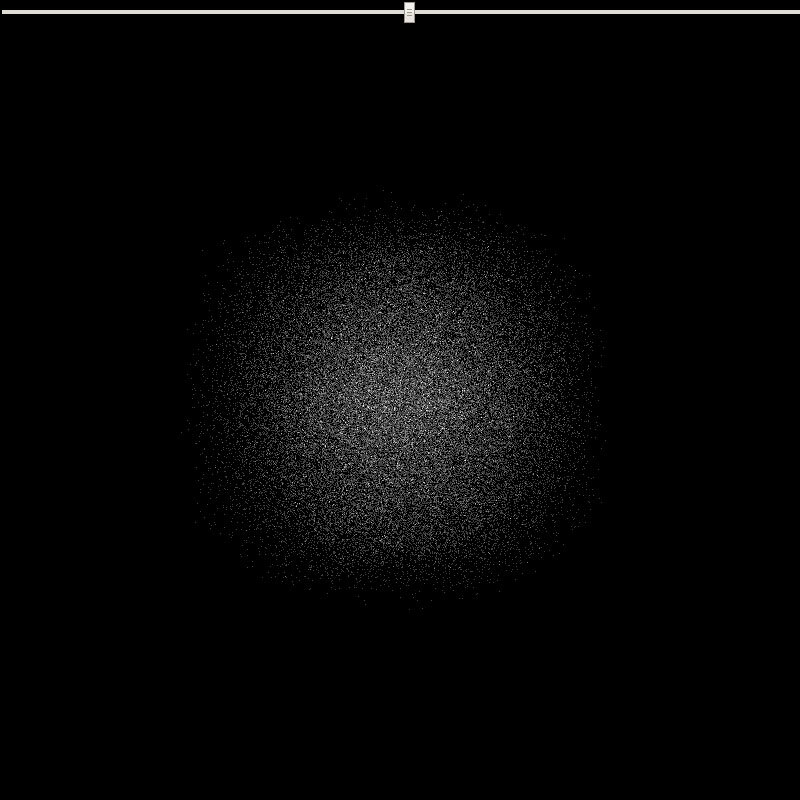 in august 2014, I started a year-long project that never shipped (which I playfully codenamed “the silent failure”), the first thing they asked for was a particle engine to emulate a shitload of particles. the first pass requires a bi-unit square, an orthographic camera and the ability to render to a texture. the second pass is your regular particles rendering routine with a twist on how to retrieve the particle’s position. we need to determine if the hardware is capable of rendering the shaders. for the simulation pass, we’ll need to use float textures, if the hardware doesn’t support them, throw an error. for the render pass, we’ll have to access the textures in the vertex shader which isn’t always supported by the hardware, if unsupported, bail out & throw error. create a scene and a bi-unit orthographic camera (bi-unit = left:-1,right:1, top:1, bottom:-1) near and far are not relevant as there is no depth so to speak in the simulation. create the RenderTarget that will allow the data transfer between the simulation and the render shaders. as this is not a “regular” texture, it’s important to set the filtering to NearestFilter (crispy pixels). also the format can be either RGB (to store the XYZ coordinates) or RGBA if you need to store an extra value for each particle. straight forward: we create a bi-unit square geometry & mesh and associate the simulation shader to it, it will be rendered with the orthographic camera. 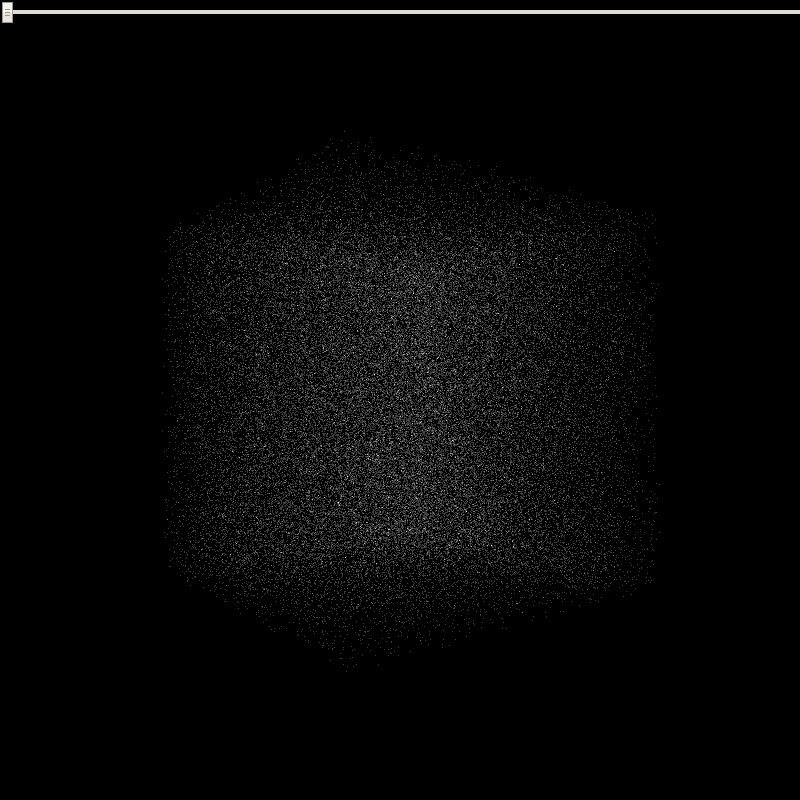 //basic simulation: displays the particles in place. the benefit of this system is its ability to support lots of particles, I mean lots of them, while preserving a rather light memory footprint. the above uses a 256^2 texture or 65536 particles, 512^2 = 262144, 1024^2 = 1048576 etc…. and as many vertices which is often more than what is needed to display …well anything (imagine a mesh with 1+ Million vertices). on the other hand particles often cause buffer overdraw which can slow down the render a lot if you render many particles on the same location for instance. it’s trivial to create random or geometric position buffers, it’s straight forward to display an image of course (vertex position = normalized pixel position + elevation), it’s easy to create buffer describing 3D objects as we don’t need the connection information (the faces) and as we shall see, it’s also easy to animate this massive amount of particles. this is what I used for the first demo not very useful apart from debug, an image is a touch more interesting, how would we do that? the getContext() method creates a 2D context to access the image’s pixels values and the loooooong line computes the greyscale value for that pixel. the method takes the geometry of the loaded mesh and the trick here is to determine the size of the texture from the amount of vertices. this total is simply the square root of the vertices count. 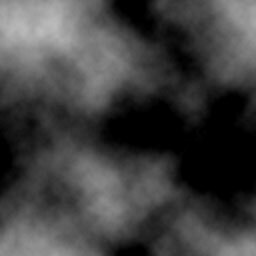 in the render shader, I compute the depth and the size of the particles is indexed on it which gives the illusion of faces but those are only particles (47516 particles, less than the first example). it needs cubic roots and involves more computations so all in all the discard method is not that bad and easier to understand (for people like me at least). now back to morphing, the way to go is to create 2 DataTextures, one for the cube, one for the sphere and pass them to the simulation shader. the simulation shader will perform the animation between the 2 and render the result to the RenderTarget. then the render target will be used to draw the particles. that wasn’t too scary right? we have our 2 DataTextures (the cube and the sphere) passed to the simulation material along with a timer value which is a float in the range [0,1]. we sample the coordinates of the first model, store them in origin, the coordinates of the second model, store them in destination then use the mix(a,b, T) to blend between the two. of course we can create more sophisticated animations, the idea is the same, anything that should alter the particles’ positions will happen in the simulation shader. it reads, if the current “uv.x” is lower than 0,998046875, it’s a small particle, otherwise it’s big. if you’re interested in the simulation shader, it’s here, I don’t think it’s an example of good practices though. to wrap it up, this technique allows to easily control insane amounts of particles, it is well supported (as compared to when I started using it at least) and – when using smaller texture sizes – it performs relatively well on most platforms ; usually GPUs optimize nearby texture sampling, which is what the FBO is based on. I’ll leave you here, all the sources are on github. rawgit serves Access-Control-Allow-Origin:* it is probably that you do not specify crossOrigin in the code. well hello there :) that was it !! updated the article, thanks a bunch! but more easily you could just push gh-pages branch and it will get official github.io url where you don’t have to deal with cross-domain stuff. However I can’t run your (and mr doobs and blursplines) examples. I am running on a Intel Mobile graphics card and it is likely that FBO is not supported there, although the WebGL checks should speak for it. Maybe you know anything about it. Thx again for explaining things! I believe this is where WebGL falls short ; the Hardware specifics … I wouldn’t recommend using this on mobile devices anyway ; you’re not the gl.MAX_VERTEX_TEXTURE_IMAGE_UNITS maybe forbidden, or worst the Float Textures. for your problem I don’t know, it seems to come from the RTT, maybe having a look at how to get a render to texture to work might help. the THREE.DataTexture needs to be defined as THREE.RGBAFormat (not THREE.RGBFormat), so that it works on Intel Mobile Chips. I found out because mrdoobs FBO examples worked where these did not. So I compared the code and tada. now I can play with FBOs on my cheap intel gpu as well :) beautiful! We see the phrase “framebuffer incomplete” in the error message. For this code, it indicates that you are unable to write floating point values into the frame buffer. The OES_texture_float extension, which the code checks, only indicates that you can create, and that the shaders can read floating point textures, not that the shaders can write to those textures. Also, for OpenGL ES, which WebGL is built on, reading textures in the vertex shader is optional, so this will trip up a lot of mobile graphics cards. You should consider the fact to create the triangles directly inside the vertex-shader, based on 3 constants located in the shader ( defined once for all) representing the 3 vertex of a triangle. The GLSL code should work in WebGL without any modification. this uses GL.POINTS instead of GL.TRIANGLES. if we use triangels, we’ll need to triple the vertex count (like in your example). it’s a trade off ; GL.POINTS will perform faster with small point size (less data to process, less overdraw) but will slow dosn terribly when the point size gets bigger. 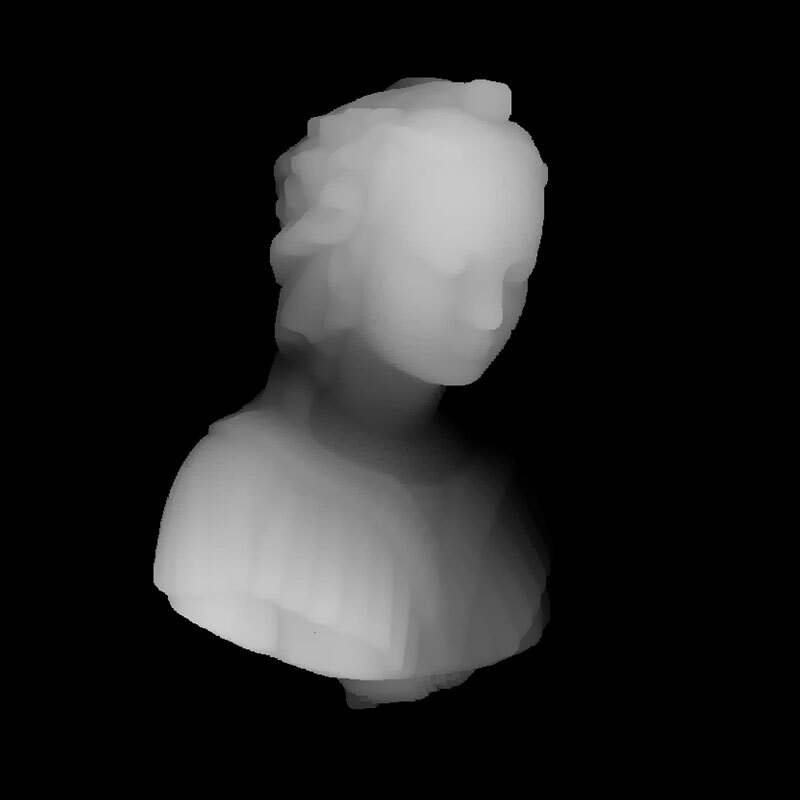 Hey Im just starting to explore Webgl and Glsl and its really blowing my mind, but I had a question! Thanks in advance and thank you for this post!!! short answer: no, at least not directly. There are different primitives to draw with in WebGL, one of which is POINT and will draw particles (what we do here), to draw lines, you’ll need to use other primitives like: LINES, LINE_STRIP & LINE_LOOP (see https://www.khronos.org/files/webgl/webgl-reference-card-1_0.pdf). the idea would be to draw a set of lines then draw the particles on top of it. looks easy enough but it requires a piece of information you don’t have in the particle system: connectivity ; indeed to draw lines, you need to know which points to connect. 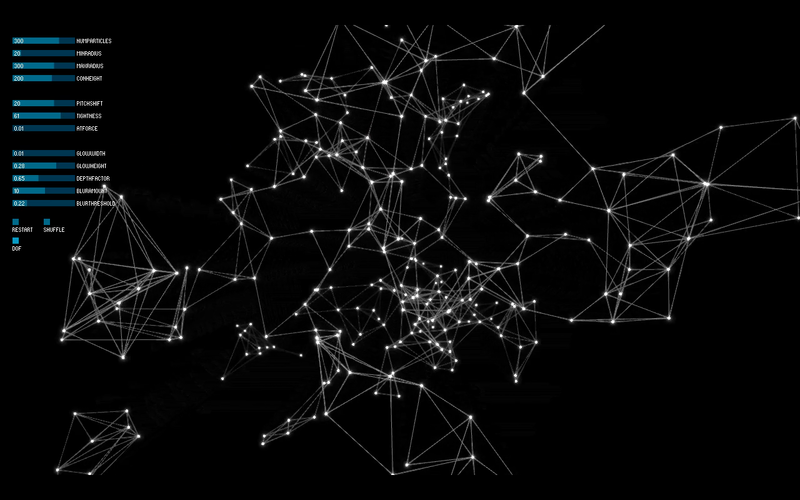 Over more, the picture you linked looks like a “node garden” (or a Force Directed Graph), it’s an emergent structure computed from the relative distance of nodes ; if they’re “close enough” draw a line, otherwise don’t. to compute this, you need to know where the nodes are before knowing if 2 nodes should be linked. this operation cannot be performed easily on the GPU (it would require a specific data structure and extra GPGPU steps) and given the amount of particles, computing on the CPU will require a lot of resources (and time). Hi! This is one of the best articles on shaders i’ve read so far. Thanks for sharing, it’s immensely helpful and clear!! I am trying to build an animation to morph meshes of any number of vertices. I have some extra vertices on one mesh that i need to hide. So, in the DataTexture i am using a THREE.RGBAFormat, instead of THREE.RGBFormat. Vertices are defined by a THREE.Vector4. Now all vertices that are not needed have xyz values set to random and the alpha value set to 0 (hidden). Everything works fine. But i cannot get that alpha value in the shaders. If i add ‘transparent: true’ in the simulation shader, I get a strange behaviour: all the particles with alpha zero get scaled to position 0! And their alpha is still 1. And in the render shaders i added a varying containing to pass the alpha value to the fragment shader. Any idea why it does not work and it scales the positions? Found the solution already and works great. Just use RGBAFormat (instead of RGBFormat) in the FBO class: in the options of the rtt (WebGLRenderTarget). Really cool project. I have this bookmarked for a few months now because i was trying to create something similar but because i am new to THREE and WEBGL i was not able to follow your instructions. In the meantime i have found this example http://www.pshkvsky.com/gif2code/animation-13/ which i was able to follow. But it doesn’t work as smoothly as yours does. I guess the ‘raycasting’ metehod is too inefficient for defining points on a mesh. I am looking for a better way to form shapes (loaded 3d object) out of particles in THREE.js. Do you have some time to explain that in more details? your question boils down to knwoing where to place particles on a mesh. if you have a mesh, the raycasting – though very slow as you mentioned – could be the way to go ; shoot X random rays at the mesh, store the intersections, rotate the mesh a bit, repeat. this is basically what the kinect (or any LIDAR device) does. then you obtain a series of points on the surface of the mesh. if you have a mesh and only need points onn the surface, you can use the geometry’s ‘faces’ and radomly distribute points on the face. this is fairly trivial. 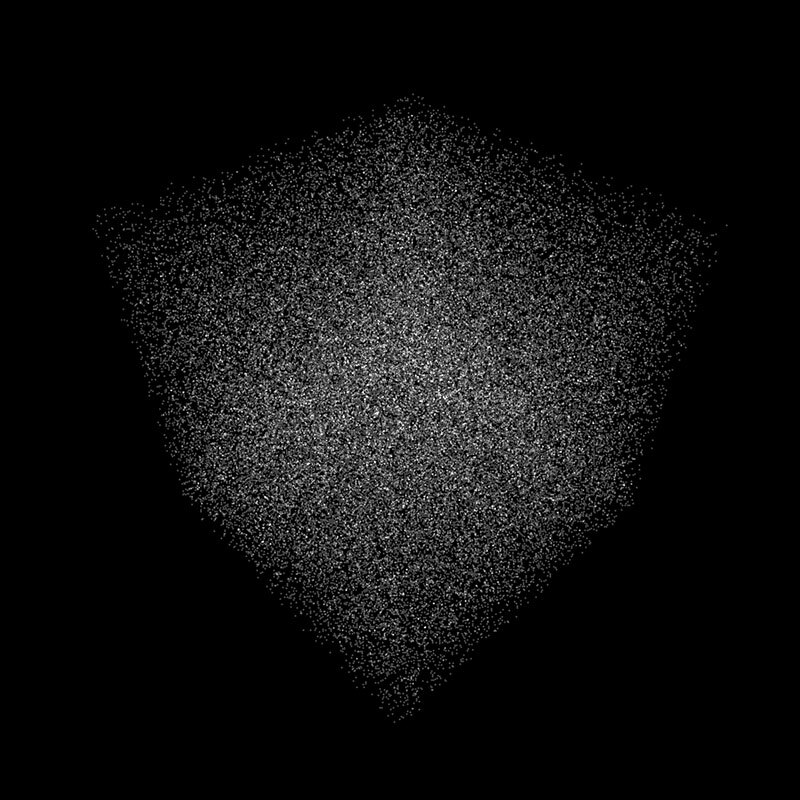 the trick here is to use a ratio based on the area of the triangles to set the amount of random particles to create for each face. Your particle effect is really cool !!!! 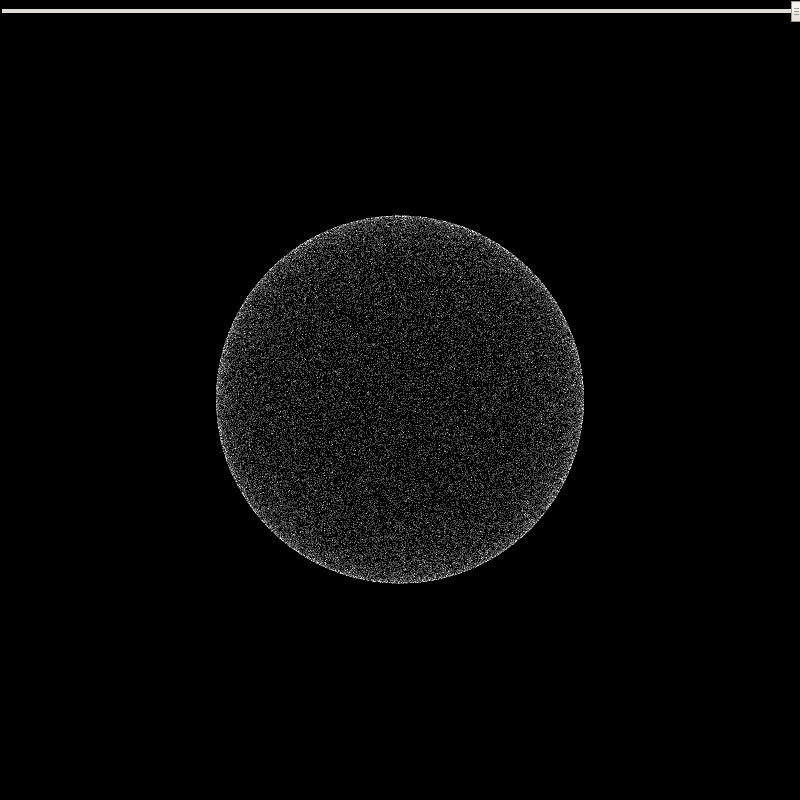 But when I try to view it on my phone, three.js throw an warning that it does not support “EXT_frag_depth”.And the effect of the particles did not appear. But I did not see “gl_FragDepthEXT” in your glsl code. ps: The performance particles on phone is very important and I really want to use your technology on the phone. Hi! Admiring this article! Good explanation!! I tried to follow your steps and what you did and have one question. Am i right, that what is done in the article may be done without FBO approach actually? 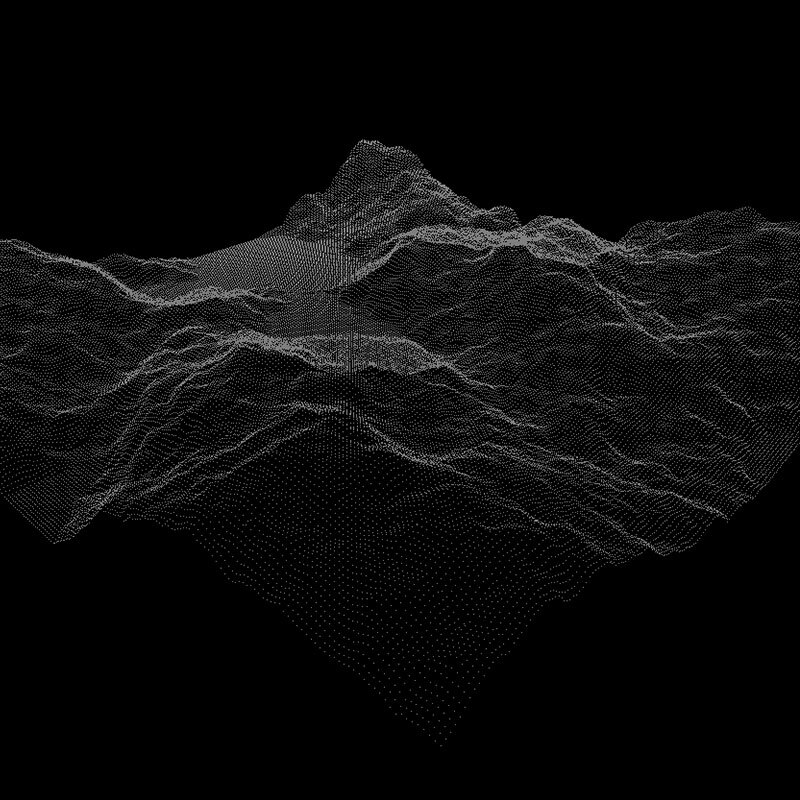 We can just compute that same curl noise in vertex shader in one pass. Based on some geometry positions attribute (your sphere) and time uniform? I mean, of course, FBO can be extended by adding velocities texture and etc. But does this exact animation in article benefit from it? Again, thank you for this article, it has been my first step into this type of animations!